When you have an Apple Watch and iPhone, there are difference ways to control the music you're listening to. If you're working out or running, or just walking to your next meeting, you may want to listen to music. The Apple Watch gives you two ways to do this: by controlling music on your iPhone, or by playing music directly from your wrist, streamed to Bluetooth headphones. You can play music from your iPhone, or from Apple Music if you're a subscriber. And you can even control your music hands-free. Here's how to play music on your Apple Watch. 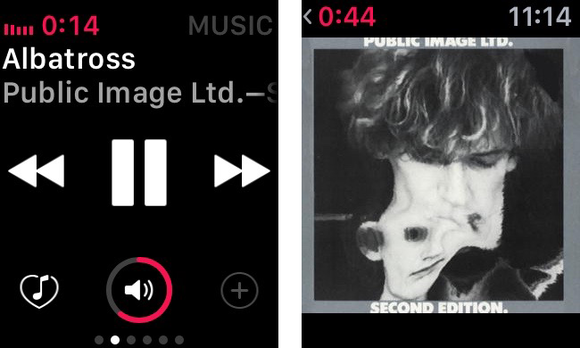 The Now Playing glance lets you control what's playing on your iPhone, or your Apple Watch. Tap the name of the item to see its album artwork. This glance controls any app that plays audio on your iPhone: Music, Podcasts, iBooks (for audiobooks), and more. If you tap the time at the top left of the Now Playing glance, your Apple Watch moves to its top-level Music controller. You can see Now Playing, Quick Play, Beats 1, My Music, and, if you scroll down, Playlists. Access music controls and choose from more music on your iPhone. Tap My Music to view all the music on your iPhone; you can tap a menu to view by Songs, Albums, or Artists. Tap an item to start playing it. 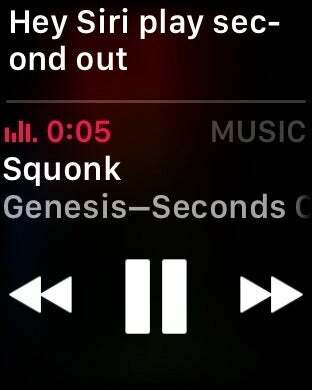 A quicker way to launch music—and a better one if you're running, for example, and can't tap your watch's tiny display—is to use Siri. If you have "Hey Siri" enabled (Settings > General > Hey Siri, on the Apple Watch), just hold your watch up and say "Hey Siri, play Grateful Dead." Or, press the digital crown to activate Siri, and give a command. Siri searches your iPhone—this can take a few seconds—and starts playing the artist, album, song, or playlist you requested. Siri can let you play music hands free. One problem with Siri is that it searches both your iPhone and Apple Music, even if Apple Music is not visible on the iPhone. So you may start playing music that's not on your device, and use data without any warning. Also, Siri's recognition is never perfect, and if you request something non-standard, Siri may not find it, or may find something very different. For example, I asked Siri to "Play John Foxx Metamatic," and Siri replied, after a few seconds, "I couldn't find 'John Fox meant to magic' on Apple Music or in your library" When I asked Siri to play John Foxx, it started playing John Fox, who, it turns out, is a stand-up comedian, not the musician. Many people don't like to take their phones with them when they run or cycle, and the Apple Watch lets you play music directly from your wrist (to Bluetooth headphones, or to a Bluetooth speaker), even if you don't have your iPhone. [Editor's note: We previously published an article on how to save Apple Music streaming playlists to your Apple Watch]. 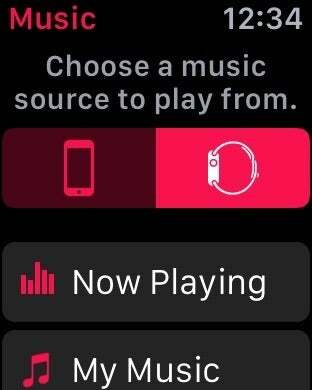 To do this, you need to sync a playlist from your iPhone to your watch. 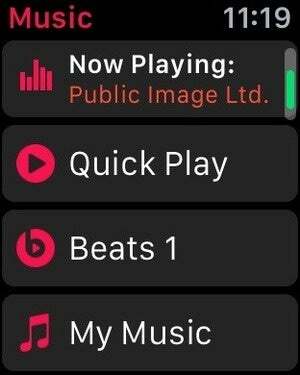 In the Watch app on your iPhone, tap Music, then, under Music Syncing, choose a playlist. Under Music Storage, set a limit: either a number of MB or GB, or a number of songs. 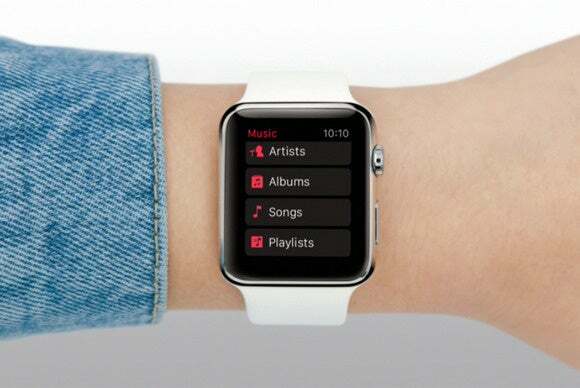 Start playing music from your Apple Watch. Note that your Apple Watch has to be connected to its charger to sync the playlist, and this sync takes a long time; it can take hours if you have a lot of music. It's best to do this overnight. To play this playlist, swipe up and display the Now Playing glance, tap the Apple Watch button, then tap My Music, and start playing. The Now Playing glance on the Apple Watch is ready for Apple Music. There's a Beats 1 button; just tap it to start listening to Apple's flagship radio station. There's also a Quick Play button. My first thought was that this would be a sort of "Shuffle All" button, but that's not the case. It plays a random selection of music from Apple Music. Sometimes when I tap it, it starts playing the first song of an album; I tap the Next button, and it plays the next song. Other times, it plays playlists; each song and artist is different. It seems to be using my Apple Music history - what I've listened to, and what I've loved - to play a selection of music that I might like. You can choose to play specific music from Apple Music if you've added music from Apple Music to your My Music library, and if you have Apple Music active on your iPhone. Tap My Music, browse, and pick what to play. If it's not on your iPhone, it will be streamed from Apple Music.